Practices and principles for Operations to write, share and rely on code. So Ansible/Chef/Puppet etc. but should apply to any code used in Ops. Developers typically have sophisticated practices for writing and maintaining large codebases. Operations typically aren't as well versed in these practices. More people can use and contribute code when it's easy to access and easy to improve. Systems Engineer at Red Hat, Brisbane. Previously at Suncorp, Brisbane and Betfair, London. But this talk is intended to be product agnostic. Why use configuration management? Surely bash scripts in an for loop over ssh will suffice? Why use python or ruby? Surely assembly or C will suffice? As with functions, modules, libraries and packages, wrap up common operations into reusable code. This might be a module for installing and configuring java, or deploying a particular application type. Chef has cookbooks, Ansible has roles and puppet has modules for grouping a bunch of operations. Ansible has modules and chef and puppet have providers for creating new operations. What happens if you run your code twice? What happens if the second time is six months from now? Give your dependencies version identifiers. Specify the version of dependency in a suitable place. Furthermore specify versions when pulling things from yum, apt-get, git, mercurial etc. While changes to reusable components hopefully don't break things, in reality changes will have some effect, and that effect might be unwanted. To avoid the risk of changes to components breaking something that relies on them, provide your components version identifiers, and specify those versions in whatever relies on them. Have some. Which one is relatively unimportant. Find out when something was changed, and by whom. Go back in time — revert changes, compare differences. Should make it easier to maintain, and allows you to source configuration from alternative data sources. Using the same tools across all environments reduces likelihood of error. Try and make it so that your code could be shared with the world without giving anything away. Only write as much configuration as you need. Some variables will be common to all applications across a particular environment. Some variables will be common to all environments for a particular application. 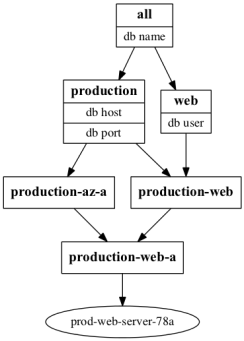 Use Ansible groups, Chef roles and Puppet's profiles to manage the inheritance hierarchy. You will need a solution to what to do with secrets. There are many. ansible-vault, chef encrypted databags, eyaml. Hashicorp's Vault, Keywhiz by Square. Separation of code and data (particularly secret data) allows you to share your work with others outside of your organisation. If you are able to share your code, you can include contributions of others, or set your code free so that others can manage improvements, that you can then benefit from. Opening the source is the start of the journey. You can also benefit from work others have done — look for modules that others have written before writing your own. They may not be perfect, but they are a start. See Ansible Galaxy, Puppet Forge, Chef Supermarket. They really hate to be the ones saying them. Best practices are an advisory of things to consider. Call them guidelines if you prefer. Standards should be testable, preferably automated. We manage our standards and best practices as a git repo using pull requests to achieve consensus. Any changes/additions to best practices and standards must achieve a body of support. Have a policy on what level of consensus is required to accept code into the mainline codebase. This will typically be a risk management tradeoff. Practices such as unit testing and integration testing are currently difficult to achieve. 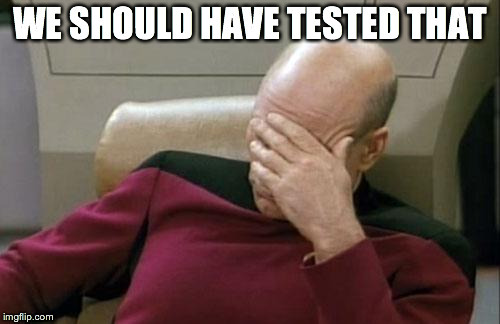 Which leaves end-to-end testing in production like environments. Virtual machines — RHEV, VMWare, Virtualbox etc. PaaS — Heroku, Openshift etc. 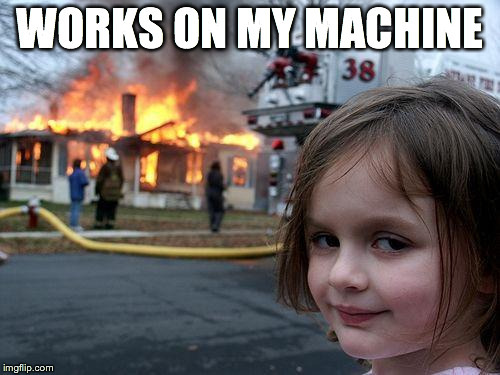 Anything that isn't "your machine"
Google Compute Engine AWS is around 2c per hour for a micro instance. Azure is similar but charges by the minute. I've yet to see the full implementation of the previous slide in practice. Focus on the things that are most likely to eliminate unnecessary errors or effort.